Mr. Fix-it is your local appliance repair service in Birmingham, Alabama. 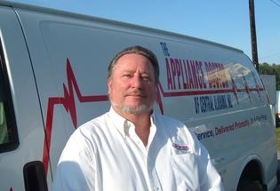 We are a locally owned and operated appliance repair company offering quality service. Our professional team is well equipped to repair your appliances. Mr. Fix-it offers immediate service for refrigerators, ovens, washing machines, dryers and much more. If your appliances are in need of repair, contact us. Call (205) 291-0211 before 10 a.m. for fast, same-day service. Copyright © 2018 mrfixitalabama.net All rights reserved.